One of the most inspirational things about the “Shrink Team Challenge” are the stories of success. I always think “Hey! If they can do it, then so can I”. Then, I put down whatever sweet I’m eating at the moment and grab a glass of water. Because I find these articles so inspiring, I thought that I would share one of the success stories. 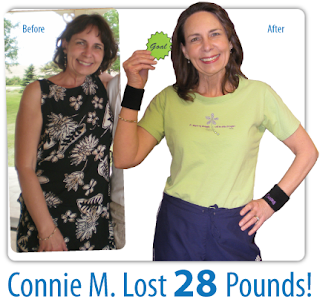 This week, I’m featuring the success of Connie Mueller. I lost 28 pounds with Vitamark's “Shrink Team Challenge” and I've kept it off. I have struggled with losing and gaining the same 25 pounds all my life. I started my weight loss plan in February 2010 and reached my goal at the end of June 2010. I ate the cookie at 10:00 AM for a boost of energy and drank the shake at 6:00 PM in place of my evening meal. I ate my normal breakfast and lunch. I have maintained my weight loss goal for over a year and I feel fabulous. Vitamark helped me create my ideal body and keep it! I have so much energy now that I became a certified Zumba Instructor at the age of 55 and I love the way I look in my new clothes! Great job Connie! You’re an inspiration to me, and you know what? If you can do it then so can I! Thanks you for sharing your story with us!